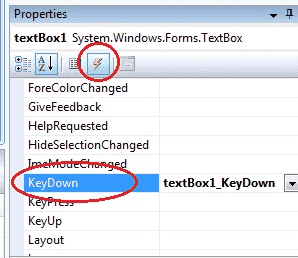 Windows Forms processes keyboard input by raising keyboard events in response to Windows messages. Most Windows Forms applications process keyboard input exclusively by handling the keyboard events. The following C# code behind creates the KeyDown event handler. If the key that is pressed is the Enter key, a MessegeBox will displayed . How to get TextBox1_KeyDown event in your C# source file ? Select your TextBox control on your Form and go to Properties window. Select Event icon on the properties window and scroll down and find the KeyDown event from the list and double click the Keydown Event. The you will get the KeyDown event in your source code editor. KeyDown Event : This event raised as soon as the user presses a key on the keyboard, it repeats while the user keeps the key depressed. KeyUp Event : This event is raised after the user releases a key on the keyboard. In order to capture keystrokes in a Forms control, you must derive a new class that is based on the class of the control that you want, and you override the ProcessCmdKey(). The following C# source code shows how to capture Enter KeyDown event from a TextBox Control. Next : How to create Dynamic Controls in C# ?